If you wanted to play a cooperative platformer on the PlayStation 4, your choices may feel a bit limited. Massive Monster has a game they think they can tempt you with, called The Adventure Pals. The game was demoed at Sony’s PlayStation Experience 2017, and we managed to go hands-on with the game while we were at the show. Take a read below. 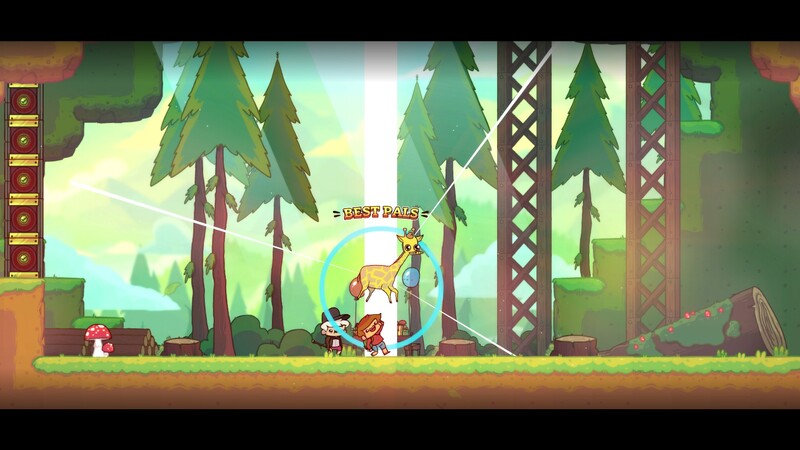 The Adventure Pals may appear cute and kid-friendly, but the platforming is fairly involved. Beyond regular jumping, wall jumping and gliding (of sorts) are also moves available. Many platforms will have enemies just waiting to push you off, and even some walls have hazards like moving spikes. On the other hand, dying doesn’t appear to set the player back very far, since the main focus is on having fun while going on a grand adventure. 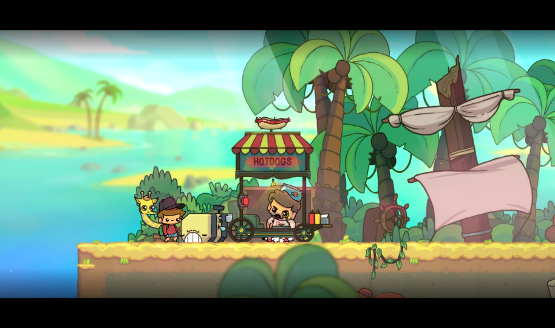 Aesthetically, The Adventure Pals may remind gamers of Scribblenauts. The world is incredibly bright and colorful, like a cheerier version of classic Super Mario. Unity is the game engine being used for development of The Adventure Pals. This means a lot of the “guts” of running the game are taken care of, and the developer can focus on building the game out more quickly and without needing to reinvent the wheel. The Adventure Pals ran just fine on the PS4 we were playing on, with nary a hiccup to be seen. The game even held its cool as we fought a giant cracked egg with bacon strips for arms and sausages for legs, summoned by an evil food vendor, which, as most of you should already know, is likely to make any respectable game engine sweat. While The Adventure Pals may be a platformer at heart, there are also combat options. The player has a sword at their disposal, and after the intro sequence, they obtain their first pal, Sparkles the giraffe. This enables hooking onto various vantage points throughout levels, granting access to places that were previously unreachable. Another pal can be unlocked, dubbed Mr. Rock, who can fight for the player. So the player is never really alone, even when playing The Adventure Pals solo. There’s yet another layer to gameplay in The Adventure Pals – ability cards. As enemies are taken out, experience points are earned, and eventually the player will level up. Each level results in three random cards being displayed, which do things such as increase ammunition capacity, increase the strength of a pal’s attacks, or even powers to gain back some health from defeated enemies. There’s definitely some RPG aspects to this otherwise unassuming-looking platformer, something that will help to keep players coming back for more. The Adventure Pals also supports local co-op, in a drop-in/drop-out manner. Co-op is still a fairly rare thing to see on games these days, though the indie scene is thankfully pushing this kind of thing extra hard. No word yet on how loot is divvied up to each player, but with a game as light-hearted as The Adventure Pals, it’s probably safe to assume you’ll get your fair share of in-game rewards. Massive Monster has a charming co-op platformer on their hands. Mixing in ability cards ensures that things don’t get stale, while drop-in/drop-out functionality also helps to keep the action going. The colorful world and quirky characters are also a refreshing thing to see in a world filled to the brim with dark shooters. Be on the lookout for The Adventure Pals when it launches in the Spring of 2018. The Adventure Pals preview conducted at PlayStation Experience 2017.